I needed to buy flowers. I’m a guy. I don’t know what a bouquet or arrangement is, I just know a few key types of flowers (Roses! Tulips! Chrisanthem.. chrisathem.. chrysan.. the ones in mum’s garden) and wanted to search for that type of flower, buy it, and get it delivered to put a smile on someone’s face. So why was this so hard? I wanted Sunflowers – they’re pretty and you can’t not smile at them. I figured hitting up Google for “sunflowers sydney” would get me some florists; at least this guess was correct. I found quite a few geo-appropriate florists, though I didn’t quite locate the sunflowersinsydney.com.au that I was hoping for. In all cases after clicking through from Google I was dumped at a website homepage. Not so good. Why was this? Read on. Once I made it to the website, I instinctively tuned out the menu structures and pictures of no doubt prohibitively expensive flower arrangements (I’m learning!) accompanied by teddy bears holding chocolate, and went straight for the search box. 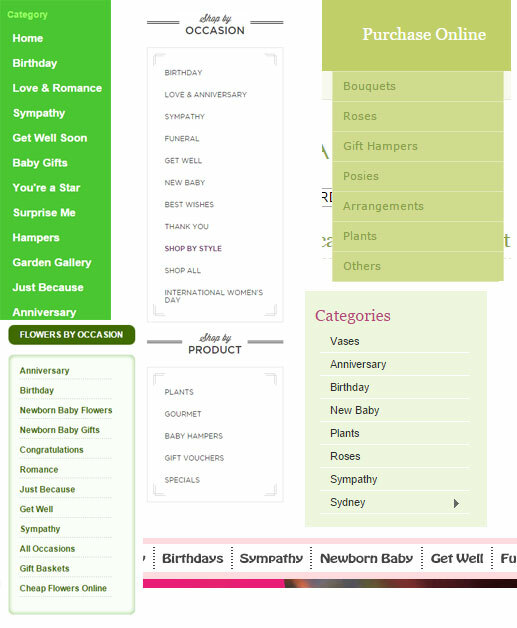 Every single flower e-tailer had exactly the same menu structure – Occasion, with optional Price filter and “Themes”. I tried at least TEN different Sydney-serving florists and found TWO that had an actual search box for me to enter keywords into. I was completely flabbergasted here. TWO. So I had to stare at the menus and decipher where my flowers might be. “New Baby”? No. “Romance”? No no. “Surprise Me”? Are you serious? The first site with an actual search box available to me returned me no results. I tried variations – sunflower, sunflowers – still nothing. Then I thought I’d try “flower” for the hell of it. NO RESULTS. YES, I’M SERIOUS. I found the only florist in Sydney with apparently no flowers. NEXT! FINALLY, after trying ten sites before it, I found one site that had a search that returned me the sunflowers that I wanted – in an attractive, logical layout that was completely responsive and mobile friendly I might add. From there it was thankfully a simple checkout process and the recipient had their flowers within four hours. Stoked. But why was this so hard? I was getting really quite frustrated here. Search is important, people. So many of us don’t want to flick through your mega-navs and seven-tiers of highly categorised products, or rely on your featured promotions on the home page to get what we want. Please consider us males who don’t know what bouquets are next time you build your website search.